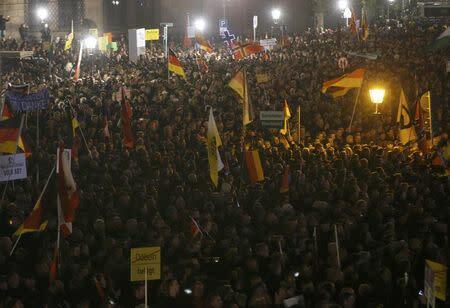 DRESDEN, Germany (Reuters) - The German anti-Islam movement PEGIDA staged its biggest rally in months on Monday, sparked into fresh life on its first anniversary by anger at the government's decision to take in hundreds of thousands of migrants from the Middle East. PEGIDA, or Patriotic Europeans Against the Islamization of the West, almost fizzled out earlier this year when its leader resigned after a photo was published of him posing as Hitler. But it has swelled again as Germany implements Chancellor Angela Merkel's decision to accept a tide of refugees that could exceed a million this year, as she argues that Germany can not only cope but, with its aging population, will benefit in the long term. Police declined to estimate the number of protesters but media put it at 15-20,000, somewhat below a peak of around 25,000 in January. Around 14,000 counter-demonstrators urged people to welcome refugees rather than whip up opposition. 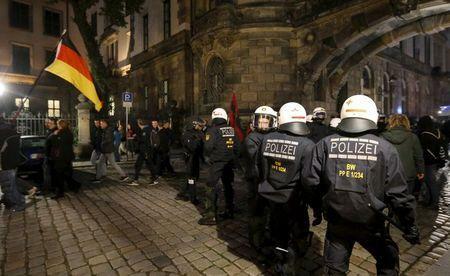 PEGIDA supporters waved the national flag and carried posters bearing slogans such as "Hell comes with fake refugees" and "Every people should have its country, not every people a piece of Germany". 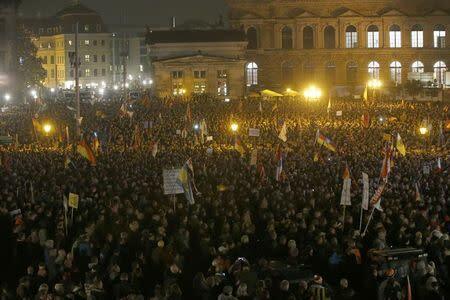 Gathering outside Dresden's historic opera house, the Semperoper, PEGIDA supporters chanted "Deport! Deport!" and "Merkel must go!". "We're just normal people who are scared of what's coming," said 37-year-old Patrick, a car mechanic. "As a German citizen who pays taxes, you feel like you're being taken for a ride." Lutz Bachmann, the leader who resigned, told the rally: "Politicians attack and defame us and the lowest tricks are used to keep our mouths shut. We are threatened with death, there are attacks on our vehicles and houses and we are dragged through the mud, but we are still here ... And we will triumph!" The counter-demonstrators marched through the town chanting: "Say it loud, say it clear, refugees are welcome here!" As many German municipalities struggle to house and support the wave of migrants, criticism of Merkel's policy has grown, her ratings have slipped, and there have been arson attacks on refugee centers. Simone Peter, leader of the Greens party and one of the counter-demonstrators, told Reuters: "We're for diversity and an open, colorful society, not hatred and violence ... the people who incite with right-wing slogans add fuel to the fire of the arsonists." PEGIDA has more than 172,000 'Likes' on its Facebook page and wants Germany to stop taking asylum seekers immediately. Interior Minister Thomas de Maiziere said on Sunday that PEGIDA's organizers were "hard right-wing extremists" and everyone who attended their demonstrations "should know that they are running after rat catchers". Thomas Jaeger, political scientist at Cologne University, said PEGIDA and the right-wing Alternative for Germany party were being allowed by the government to define how the refugee crisis was perceived by many people. "What seems to be worrying a lot of people now is that people from different cultures are coming here, and they don't know how they will integrate, and that's quite a diffuse fear, and that's now being exploited by some political forces."